Multi-cloud management platform providing end-to-end automation. Provision your multi-cloud environments through a self-service catalog. Easily integrate with your existing processes and tools through automated workflow capabilities. Leverage IBM® Watson® to troubleshoot, pinpoint and predict outcomes while seeking prescriptive guidance for intelligent workload placement. Consistently manage and govern across all of your cloud environments. Simplify your multi-cloud provisioning by utilizing open source and industry standards such as Terraform. Reuse your existing skills and Chef scripts and avoid vendor lock-in. Use your existing tools (IBM Cloud Brokerage, IBM DevOps, IT management, etc.) 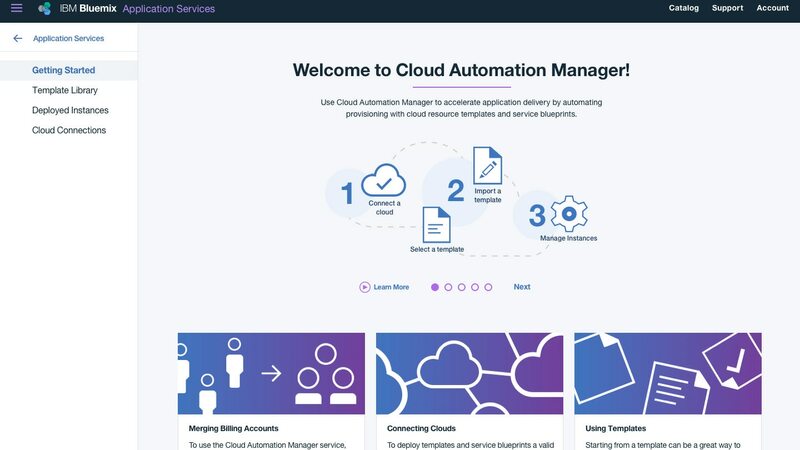 to extend IBM Cloud Automation Manager capabilities. Pursue innovation by building new apps on the cloud and modernizing traditional ones.